Yes, this is my post for the Diva Challenge #235 this week ! The challenge is to use stripes as a string in your tile. And I made this one while my children where looking 'K3 is looking for K3' on the Belgian television. 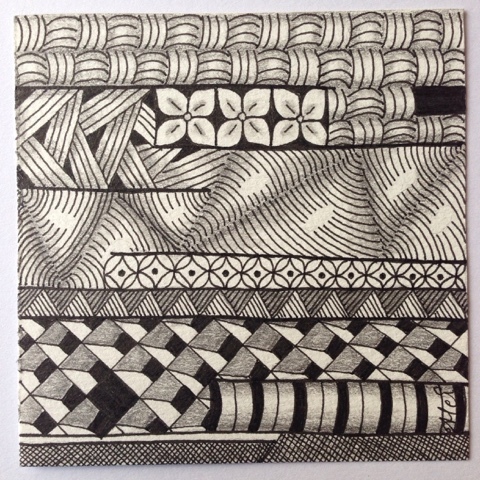 Plenty of time to zentangle. May be I do it next week again, and try to make a series of K3-evening-tiles ! We'll see. In this one I used Cadent, Buttercup, Cubine, Flutter, Baton, Isochor, Barberpole. Zo, K3 is nu ook bekend in USA :-) Wat een leuke tile met goed gekozen tangles. Alleen zie ik Cadent niet???? I love your tile: very clear, straight and perfect drawn..